First, you want to purchase the machine. My first machine was purchased from HSN (Home Shopping Network) on flex-pay. I really wanted to own a Cameo but didn’t have the full $250 to invest. In a few of the Facebook groups, I saw people sharing about how they’d purchased their machines from HSN and my mom had been telling me about all the things she’d purchased through the company on flex-pay. I thought it was the perfect way to get going. I also started earning money using my machine right away, so the payments were easily taken care of. About two years later, I needed a second machine very quickly. I ordered it from Amazon and received it in two days because of my Amazon Prime membership. *If you don’t have an Amazon Prime membership, I highly recommend that you sign up for a free 30 day trial. A lot of the things I’ll mention here will get to you in two days and you’ll be able to enjoy them so much faster. Next, (this step is optional) if you want to make anything that prints and cuts you will want to buy a printer. Because I wanted to start making stickers with my machine, I ordered a Canon printer. If you already have a printer that you love, you can skip this step. I purchased a Canon printer because I’d done research about printer quality on matte and glossy paper. All of the consumer review sites listed Canon printers as affordable and good quality. They no longer make that printer and I have since purchased another Canon that I love and use often for printing things to put in my planner or things I need to mail. Most people will see the cost of Canon ink and be shocked that I don’t go with another brand. The truth is, I don’t use their ink in my printer. I buy generic ink from Amazon or Ebay in bulk. So much less expensive and I can’t complain about the quality. Then, you will want to purchase the materials you need for your project. At the time I wanted to make stickers, so I got sticker paper from Onlinelabels.com They were the top provider of sticker paper for many of the people I knew and they have great prices with lots of options. Even if you’re just buying labels to print your address on, I recommend them. Later, when I wanted to start with using vinyl, I purchased it from Nova Rhinestone or The Vinyl Spectrum. There are so many places that you can order vinyl from but I went with these two because they had the best prices and they answered my questions (amazing customer service). I avoided Amazon because I wasn’t sure if what I would be getting was authentic (yes, there are fake vinyl sellers) and the best quality for what I needed. Oracal 651 was the permenant adhesive vinyl that I wanted and Siser Easyweed was the heat transfer vinyl that I started with. I still use them both after four years of making things with vinyl. The Silhouette brand material was not worth trying based on the reviews I read and I’m glad I didn’t waste time and money with it in the beginning. 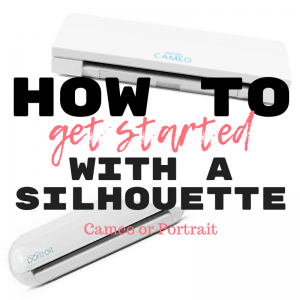 After everything is ordered and in route, you should download the Silhouette Studio software. You do not need to have your machine in hand just yet to access the software and it’s good to at least have some idea of what it looks like before the machine arrives. Downloading the software helped me to figure out the basics to start. I also suggest watching a few YouTube videos that show how the software is used. 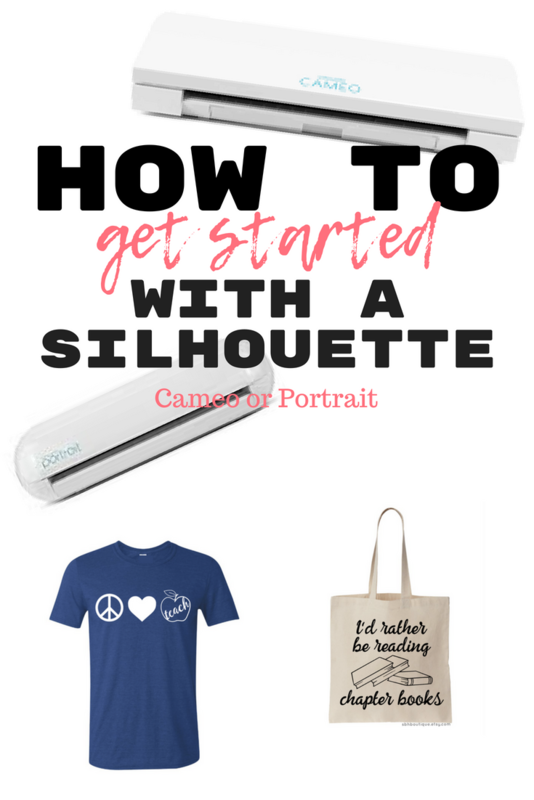 The Rhinestone World makes awesome videos using Silhouette Studio. They also offer online webinars that walk you through completing projects and answer questions along the way. I will say that the software is what holds most people up, in my opinion, but it is the easiest to use and learn. When you’re ready to really get into heat transfer material, I’d suggest a heat press. Here is the one I purchased from Amazon (along with the warranty that Amazon offers) and it’s still going after 3 years of use for myself and for business. I ordered the swing-away version because I thought it would help me avoid burning myself on the top heat plate. It does take up a lot more room and it has not helped me be 100% burn free. I’m still happy with it. I’d most likely purchase a clamshell heat press in the future just because of the space requirement. There are lots of places that sell heat presses. I went with Amazon because it shipped quickly and there was the added protection of the warranty. I know that Nova Rhinestone sells them as well. 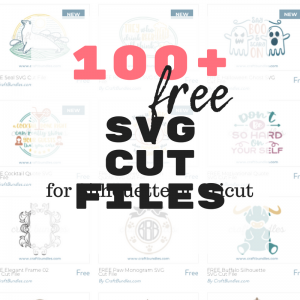 You will want to get a paper trimer or rotary blade and cutting mat to cut your vinyl. Vinyl comes in 12 inch tall sheets or rolls. It can be tricky to cut the right size with just scissors. I only recommend a rotary blade and cutting mat if you’re experience with these tools because they can be very dangerous for just hobbiest to use. If you’re working with heat transfer vinyl, you will also want a teflon sheet and press pillow. One of the biggest issues people have is when HTV doesn’t adhere properly. Usually it has to do with the pressure of the heat press and the seams or hems that make get in the way when pressing. If you have a pressing pillow, you can avoid a lot of issues right away. If you are using adhesive vinyl, you will need transfer tape. I do not recommend contact paper. The adhesive on contact paper is not suitable for using on vinyl. It can leave behind a sticky layer on top of your vinyl or be too stick to release the vinyl once you are ready to apply it to a surface. I purchased a huge roll of transfer tape from Nova Rhinestone about three years ago and still have quite a bit left. If you’re working with any type of vinyl, you will need storage for it. I have three of the plastic bag dispensers from Ikea that hold my rolls of HTV and I keep my adhesive vinyl stored flat in scrapbook storage containers from Michael’s and Amazon. I keep them color coded for easy access. Have you been wanting to buy a machine for a while? What questions do you have about getting started? Feel free to comment or email me and I’d love to help you out!